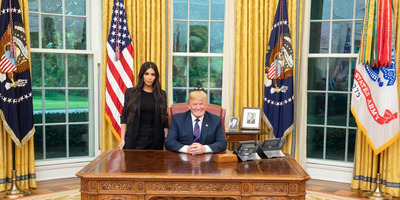 The White HouseDonald Trump and Kim Kardashian West. A few thoughts on President Donald Trump’s granting clemency to Alice Johnson, the 63-year-old great-grandmother who had been serving a life sentence for a first-time, nonviolent drug-trafficking offence. The sentence commutation is good, and it’s good for the reasons the White House laid out in a statement: “Those who have paid their debt to society and worked hard to better themselves while in prison deserve a second chance.” Johnson’s sentence, imposed because of a mandatory-minimum sentencing law, was unconscionably excessive and did not allow for redemption or rehabilitation. Kim Kardashian West did a very good thing here by lobbying the president to release Johnson, and she deserves praise for it. She had an opportunity to use an audience with the president for good, and she took it. That’s more than can be said for most people who meet with him. In general, presidents have been too reluctant to use the pardon and commutation powers. This reluctance stems in large part from a cost-benefit analysis: Release a convict, and you can be painted as soft on crime, especially if the person reoffends – there is rarely any political cost to not releasing a convict. In this particular instance, Trump’s unusual confidence that he won’t be held accountable for his actions has been a plus; in the unlikely event that Johnson reoffends, I assume Trump will simply insist it was Democrats who released her. There are news reports suggesting some of the president’s top advisers discouraged this move. Other commentators have groused that the president circumvented the usual review process for pardons and commutations. But this is a process that has institutionalized the excessive caution I describe above – it hasn’t served us well. This is one area where Trump’s willingness to shrug off the bureaucracy, disregard norms, and act impulsively has paid off. A president who listens to celebrities who present him with sympathetic pardon and commutation cases will probably, on average, be acting in the direction of justice, even if he occasionally releases people who would be better kept in prison. This is one area where I hope Trump’s norm-breaking persists past his term. I hope future presidents will be willing to dispense mercy more liberally, without regard to advisers who warn them of the political risks. And I hope the president is looking for more cases like Johnson’s, as part of a rumoured pardon push. There are a lot more prisoners like her, in large part because of ill-considered laws that require excessive sentences. All that said, I have two caveats. The first caveat: Mercy – even liberally dispensed mercy – is not a substitute for rational sentencing. It’s been pointed out that Trump is showing mercy toward one drug trafficker while calling for the death penalty for others. I don’t think this is the contradiction it initially looks like. Of course Trump would like a system that allows him to seek harsh sentences and also to waive those sentences on a whim, since that system invests him with the sort of enormous, unilateral power he enjoys. But it’s not a good system. The implication of the sentence commutation is that this life sentence was grossly excessive. The law should not have allowed, let alone required, its imposition. Some Republicans in Washington have pushed for sentencing reform, including the rollback of mandatory-minimum sentences, but Attorney General Jeff Sessions has been one of the loudest opponents of such reform. Maybe Trump can be talked into backing the sentencing-reform push if he realises how much it will annoy Sessions. The second caveat: Trump likes the pardon power for several reasons. Some of those reasons are less edifying than the ones operating here. Using the pardon power to troll the libs (Dinesh D’Souza, Joe Arpaio) is bad. Using the pardon power to settle scores with investigators you see as undermining your personal interests (Scooter Libby, D’Souza, possibly Martha Stewart) is bad. Using the pardon power to interfere with an investigation into you would be extremely bad. We can differentiate Trump’s good pardons from his bad pardons. The rule of thumb should be that an enthusiasm for pardons is good so long as the pardons lack a financial, political, or criminal nexus with the president or his associates. This is not a hard distinction to draw.